Is there any further, more detailed, RA training for my particular RA role? NHS Digital launched the Care Identity Service (CIS) in February 2015, introducing new Authentication, Directory and Smartcard Identity Registration services for secure access to Health and Social Care data. This service replaced the former spine identity management service (UIM and CMS) and is currently being used by RA (Registration Authority) Managers (RAMs) and their RA staff (RA Agents, Sponsors, ID Checkers and Local Smartcard Administrators) in each of the RA Service Provider Organisations who manage Smartcard access for 1.1 million Smartcard holders/healthcare professionals across the country. RAMs are trusted individuals who are nominated by the Board or Executive Management Team to act as the RAM for that particular Service Provider Organisation and any subsequent child organisations. They are responsible for developing and implementing local RA policy and processes, creating a digital identity for healthcare professionals who require access to data held on clinical/non-clinical smartcard enabled systems. RAMs are also responsible for production and management of Smartcards, assignment of the appropriate access rights to an individuals Smartcard, setting up the RA governance structure and ensuring all newly appointed RA staff receive the appropriate level of RA policy and role specific training and are competent in the use of CIS. This training course has been designed to help RAMs in their training responsibility and is an interactive tool that outlines the key areas of National RA Policy, including the importance of verifying a healthcare professionals identity to the required standards, reaffirms the importance of compliance with national RA policy, the use and issuance of Smartcards and identifies any policy changes since the introduction of CIS. The course will take approximately 25 minutes including a 5 minute assessment at the end, which requires a 100% pass mark. 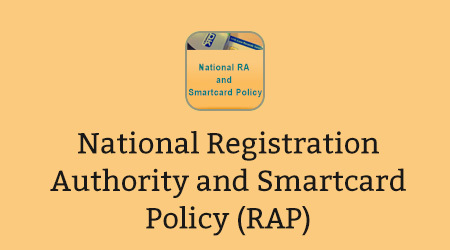 RA Role Specific training materials can be found here: https://digital.nhs.uk/article/311/Registration-Authorities-and-Smartcards however, you should liaise with your local RA Manager about how and when to complete this. If you already have an account with e-LfH, then you can enrol on to the National Registration Authority (RA) and Smartcard Policy programme by logging in to the e-LfH Hub, selecting My Account > Enrolment and selecting the programme. You can then access the programme immediately in the My e-Learning section. The National RA and Smartcard Policy programme is also available to NHS healthcare staff via the Electronic Staff Record (ESR). Accessing this e-Learning via ESR means that your completions will transfer with you throughout your NHS career.